the photos of records are excellent. if you want to sell the “Amoy Opera instrumental – Country Love Company – 5318”, I want to buy. Thanks for the correction. 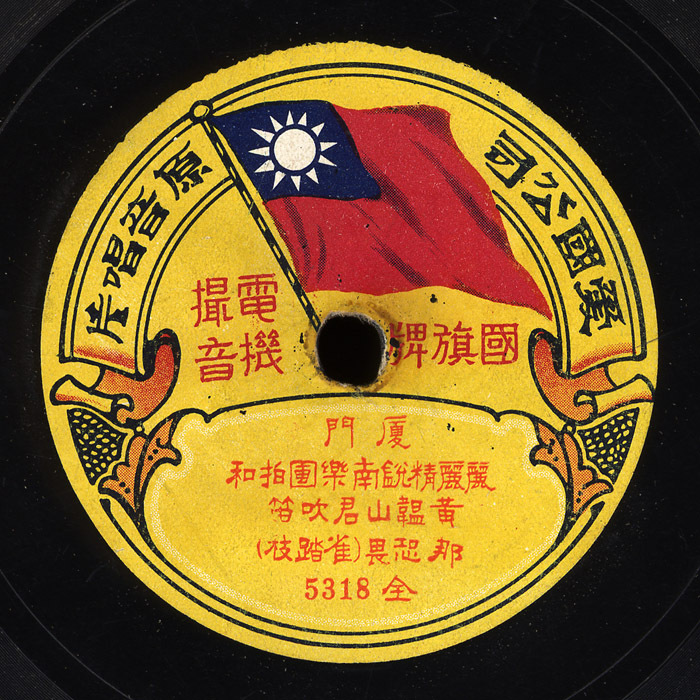 I’ve edited the post and added a link to a more detailed history of Taiwan. while 爱国公司 can lit be translated as ‘love-country company’, ‘爱国‘ is an established compound that means ‘patriotic’. the label says it was published in Amoy (now known as Xiamen). Makes sense that they’d put a ROC flag on the label if it was published pre-1945. That version of the flag wasn’t adopted officially until 1928: http://en.wikipedia.org/wiki/Flag_of_the_Republic_of_China. So it must have been published sometime after then? Also, I think the number at the bottom is how many copies they printed. Sorry, but this recording has nothing to do with Taiwan. The flag is for the Republic of China. It’s not the Taiwanese flag. And the language is Amoy/Xiamen/Min-nan/Hokkien, of which Taiwanese is one dialect. The label, 爱国, is pronounced “Ai-Guo” (Patriotism) in Mandarin/Guo-Yu/Putonghua language, but in Amoy it would be “Ai-Kok”.